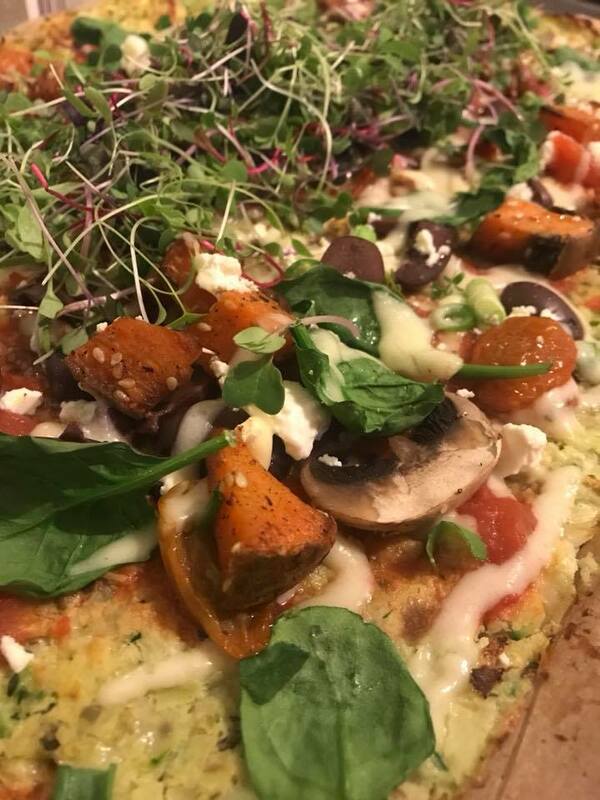 Imagine a pizza topped with amazing flavours, is healthy and doesn't leave you bloated? Sound like heaven? It's here! Check it out! 1/2 cup Roasted Sweet Potato (or pumpkin) *Coat in olive oil, salt and pepper and pre roast* Once roasted I sprinkled sesame seeds to be a know all. 1/4 block Danish Fetta - crumbled Unless you are vegan, cashew cheese would be awesome! Garnish - Microgreens or sprouts for BOOSTED nutrition! **Of course you can add any topping you like, zucchini, meats and..... even.... pineapple to start WW3 in your home about whether pineapple should be on pizza. Personally I love it! 1. Blitz up your cauli florets in a nutribullet/blender. You want it blended pretty well so no massive chunks. 2. Put in a bowl, add eggs, cheese or cheese alternative and oregano flakes. Mix well by hand, well with a spoon. 3. Grab baking tray, line with baking paper, not a newspaper, you'd have a fire. Then press mixture flat on to tray. Put another layer of baking paper on top and throw it in the over on 160 for ten mins. Don't actually throw it. 4. Ten mins to prep your topping and now take off the baking paper top layer and place back in oven to brown up for 10 mins. *If it's black, you scrolled Facebook and got distracted and now you've ruined dinner. Go back to step one and start again. 6. Take out pizza base and add your topping artfully as we all know this pizza need to be Instagram worthy right. No-one cooks for taste anymore. Sigh. 7. Put back in oven for 6 mins or so to allow topping to cook off nicely. Another tip: Natural yoghurt with fresh chopped mint and a squeeze of lime on this pizza is amazing, especially if you do it in a fancy zig zag pattern. 8. Eat. Post pic to our amazing PinkFitz Healthy Homo Facebook group for all to see you enjoy! AND of course if you are tired of feeling low and confused and stuck in a rut we have our amazing lifestyle programs. PinkFitz Happy, Healthy Homo! The Ultimate LGBTIQ Lifestyle which helps you reach your weight loss goals, gain energy, gain healthy habits and FEEL AMAZING! You can apply here "I want a great lifestyle"
You are only ONE choice away!